Do you own the Crockpot Express Multi-Cooker? It’s a pressure cooker, slow cooker, rice cooker, etc. and is very similar to the Instant Pot. 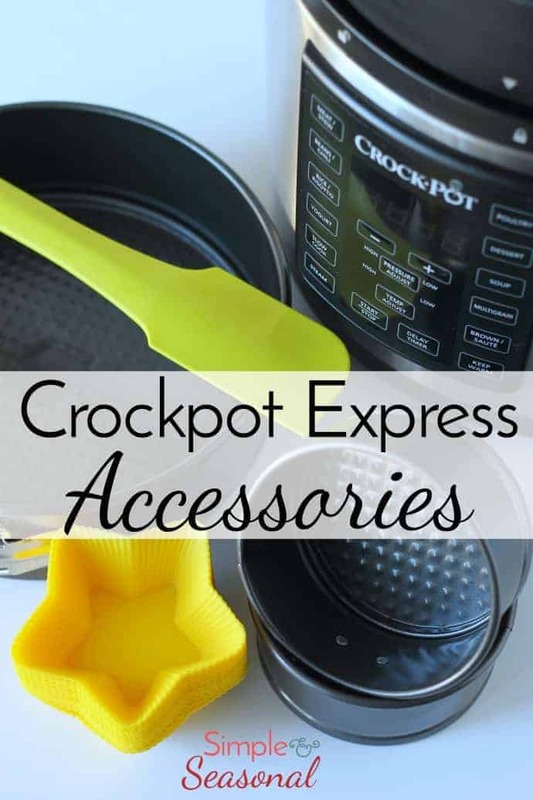 There are a few differences, however, that make it necessary to create your own wish list of Crockpot Express Accessories! Why is it that as soon we get something new, the first thing we want to do is accessorize it? 🙂 When I got my Crockpot Express Multi-Cooker, I immediately started a wish list on Amazon for all sorts of Crockpot Express Accessories to allow me to cook different things and make it more fun! Some of these things I already own, and some of them I plan to own in the very near future. While you don’t need any of them to be able to use the Crockpot Express, they certainly make things a lot easier. Many of the Instant Pot accessories will work with the CPE as well, but not all of them, so be careful and check sizes! The Crockpot Express is only available in 6 quarts, so the bigger inserts and pans will not work. Vinyl Decal Stickers-this definitely falls under the category of “want” and not “need.” 🙂 There are lots of different styles available on Amazon and Etsy. If you have your own cutting machine, you can whip up a vinyl decal in a second! Beauty and the Beast has always been my favorite movie, so I’d love this one! Silicone Cooking Rack/Trivet-one of the biggest differences between an Instant Pot and the Crockpot Express is the inner pot. The CPE has a non-stick inner pot, while the IP has stainless steel. For this reason, it’s best to buy silicone pans, utensils and trivets so the finish on the Crockpot Express’ inner pot doesn’t get scratched. Egg Steamer Rack-one of the first things I made in my Crockpot Express was “hard boiled” eggs. It’s a great way to get familiar with the machine. The eggs come out perfectly and they are SO easy to peel! Using a rack like this can help make it easier to cook several eggs at once. Springform Bundt Pan (7 inches)-you need a pan like this to do “pot in pot” cooking, which is for things like cheesecakes, monkey bread, lava cakes, cornbread, etc. Having something to bake in opens up your options for all kinds of recipes. Parchment Paper Liners –while you do not need a liner to cook in the Crockpot Express (the non-stick pan is so easy to clean) this is an option for keeping aluminum and stainless steel pans from scratching the finish on your inner pot! Gripper clip-this is a handy little contraption! Lift out your inner pot without getting your fingers burned or losing grip! I see them use things like this on Iron Chef once in a while-very handy! Mini Loaf Pan -here’s where you have to think about sizes. The inner pot is 8″ across, so you can’t get anything larger than 7″ or so in there. This is a loaf pan, which is a nice idea for meatloaf, but remember, it’s only 6″ long. So it’s a mini loaf pan. If you’re cooking for just one or two, it’s perfect! Sealing rings-good news! The Instant Pot sealing rings fit perfectly in the Crockpot Express! This is especially good because as of now, they don’t have them available on the Crockpot website. Some cooking odors are VERY hard to get out of the silicone gasket-cumin is especially overpowering. But for just a few dollars, you can have two extras ready to swap them out while you clean them. Springform pan-this is just a basic springform pan that you can use for all sorts of pot in pot recipes. It doesn’t have the fluted insert for things like monkey bread or angel food cake, though. Mini Springform Pans -use these like you would ramekins for small individual recipes. They are sized perfectly for making a homemade “egg mcmuffin” for breakfast. Silicone Starter Kit (mitts, pot lid and pot holder)-the mini mitts are perfect for grabbing the edge of the inner pot to lift it out. The pot holder protects your counter and the sealing lid is great for doing pot in pot recipes! Silicone Egg Bites Mold-while they aren’t the prettiest to look at, egg bites are a great way to pack a lot of flavor and healthy nutrients into your breakfast! Think of them like little omelettes. Silicone Steam Basket-I love the handles on this steaming basket for easy lifting! The high sides keep water out of what you’re cooking and it’s big enough for fish fillets, too. Stainless Steel Steam Basket -if you’d rather go with stainless steel, expandable steam baskets like this traditional one will fit in the pot and cook beautifully. Stainless Steel Steam Basket with Dividers– I love this idea! You can cook more than one vegetable (or anything) at a time and keep them separate with the removable dividers. Bundt Pan (6 cup)-smaller than a typical fluted pan, this is perfect for breads and smaller desserts. 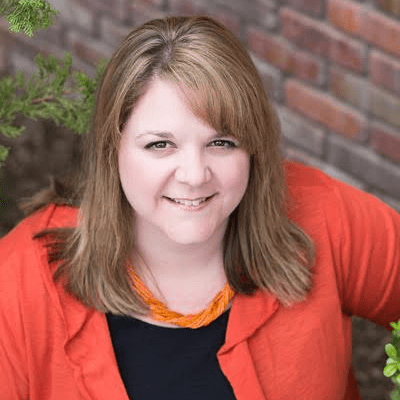 The product dimensions are listed all over the place, but the reviews show that others are using these in their pots with success. Silicone Baking Cups -If you don’t want to purchase a mold, you can simply get separate baking cups like this and place them inside another bowl or on the trivet to cook! Silicone spoons-because the non-stick surface of the Crockpot Express can get scratched easily, you need to use wooden, plastic or silicone utensils for stirring and scooping. Crockpot Express Cookbook-now, this comes with a disclaimer. There are several books listed on Amazon, but most of them have terrible reviews. Several people in our Crockpot Express for Beginners group on Facebook have echoed that sentiment. They are full of errors, missing pages, typos and the instructions are not clearly for the Crockpot Express. However, this book seems to be the best option on Amazon right now. If you really prefer to have a printed book on hand, this is your best bet. Other than that, I’d suggest following blogs (like mine) 😉 and getting suggestions from other users. If you’re still getting the hang of using your new Crockpot Express, be sure to check out my Crockpot Express Cooking Guide and FAQ’s! You can download and print this cheat sheet (without the watermark) as well as get answers to some of the most common questions asked. Also, join our Crockpot Express for Beginners Facebook group for great support! Do you know when we will be able to buy additional pots for the CPEC?? I haven’t had mine long and the nonstick coating is already scratched. What size pot are you looking for? I received the crockpot express for christmas, but most of the recipes are for instant pot and I don’t seem to beable to adjust some of the recipes. I found yours for poached chicken, great, do you have a cookbook for the crockpot express? If not how can I get more recipes from you. Sometimes I just want to do the bacis in the pot. Thank you for your efforts, so appreciated I don’t do a website, I am older and just do basic computer. The recipes for Instant Pot and Crockpot Express are fairly interchangeable. The button names are just different. Most recipes call for “manual” and only the newer/larger versions of the CPE have a manual button. 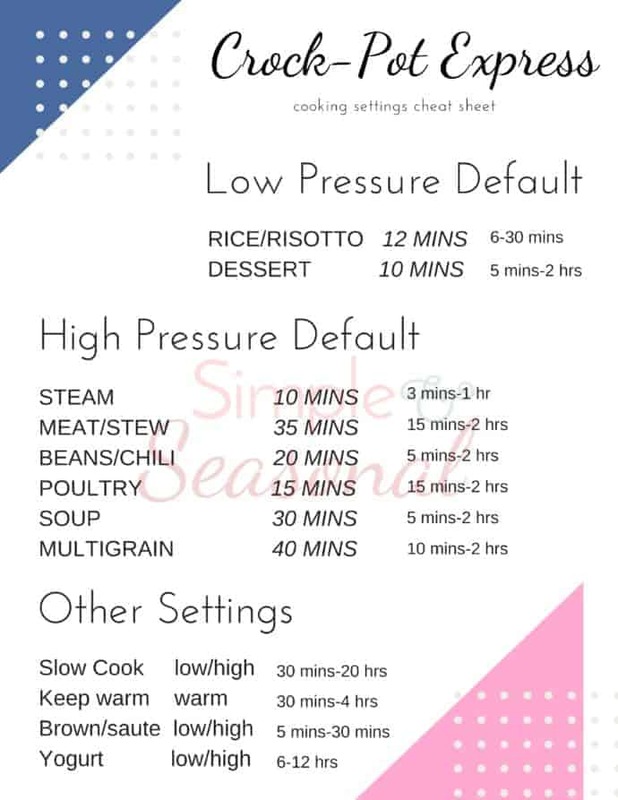 However, since all the pressure cooking buttons do the same thing, you can use any button you choose and just adjust the time up or down as needed. I stick with Beans/Chili or Steam for just about everything to be honest. The non stick inner pot is starting to get scratches and I can’t find anywhere if it is teflon. Can you get an answer for me. I want to make sure that it is safe to use. Thank you. I’m afraid I can’t answer THat definitively for you. You should contact Crockpot directly. They seem pretty good about responding to questions On their sales page for the CPE. does the 6 qt. instant pot inner pot fit inside the Crock-Pot express cooker? can they be used interchangeably? No they cannot. The rim/lip of the lid is different and while it technically fits, it doesn’t come to pressure properly and leaks steam. It will also void your warranty, so stick with Crockpot brand only for your inner pot! Have you had any issue with the inner pot of your CPE warping? I read reviews on the CP website and a few people had complained of this after using the CPE for a few months. I’m assuming it’s hit and miss but was just curious if you’ve experienced this as I haven’t (yet). No, I haven’t had any problems, and I haven’t heard of any in my group. Hopefully it was either just a small group of people, or they are fake reviews (which happens a lot, sadly.) I know you can replace the inner pot, but they seem to be running out of them all the time on the website. I’m going to keep my eye open at garage sales and thrift stores for a second CPE. Thk for ur many effoorts to helps us go from fledglings to very proficient cooks. As for the books available, — hard bound, the maln miss was page #s. I do have the above Zinman aongst others. His page numbering was missing for the 1st 13. I bought all i could in December 2017. Maybe the printers were rushing to churn these out — we see the consequences. Fyi my cell is using italic print. Not sure why & it is tiny. But, thk again 4ur help. You’re very welcome! And yes, I’m sure it was just because they were rushing to put out books in time for Christmas. Many of them are Instant Pot books that they simply switched out the cover and intro pages, but the instructions aren’t specifically for the Crockpot Express! Hopefully they will see the need and get something together soon. I’m working on an eBook that will be printer friendly for those who like to have a printed recipe book instead on online recipes!